Disney World has a bunch of cool things to do when you're not visiting the parks. One of them is a cooking class for kids. The space is limited, so you have to sign up way in advance. I assumed that the kids would be measuring ingredients, mixing cookie dough, shaping cookies, etc. When I asked the boys what they did, they said that (besides decorating their aprons) they put sprinkles on the cookies. Yup. That's it. Thirty-something bucks a piece and two hours and they put sprinkles on. 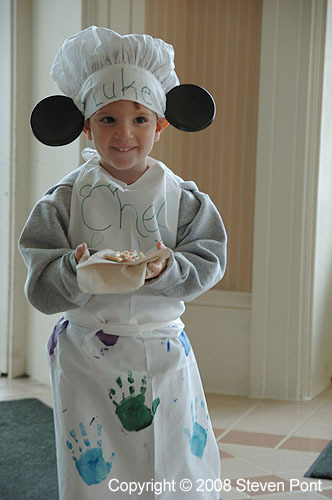 If they hadn't come out looking so cute (the boys, not the cookies), Mickey and I might have exchanged words. There are some moments in life that are just a little too tempting. 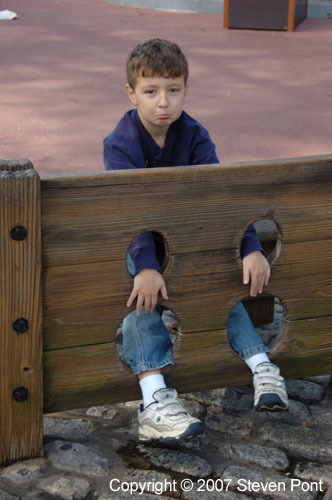 As much as I love my children, I think every parent has one or two moments when they would like to lock their little angel in the stocks and yell, "Okay, see you tomorrow!" while walking away. Alas, Child Protective Services frowns on that sort of hands-off parenting, so I guess I'll have to stick with taking away the video games when things go awry at home.